Each university guardianship student will receive a welcome pack by email on arrival. This includes guides and advice about living and studying in the UK and other important information. They will also receive a membership card and details of their Bright World Buddy who is there for them should they have any problems. Most students do not require their Buddy to visit them but others prefer to meet their Bright World Representative. We have two options to choose from on this basis. Option A. does not include a visit and all communications are by telephone. Option B. automatically includes an arrival visit. If after arrival, you wish to switch to Option b. then a £100 supplement will be payable. Option A. - basic guardianship Termly Service Fees including VAT Term 1 - £240 Term 2 - £180 Term 3 - £180 What is included Basic & Full Guardianship University Guardianship Liaising on your behalf with the university for unexpected situations. 24/7 emergency phone service for students and parents Bright World fees Option B. 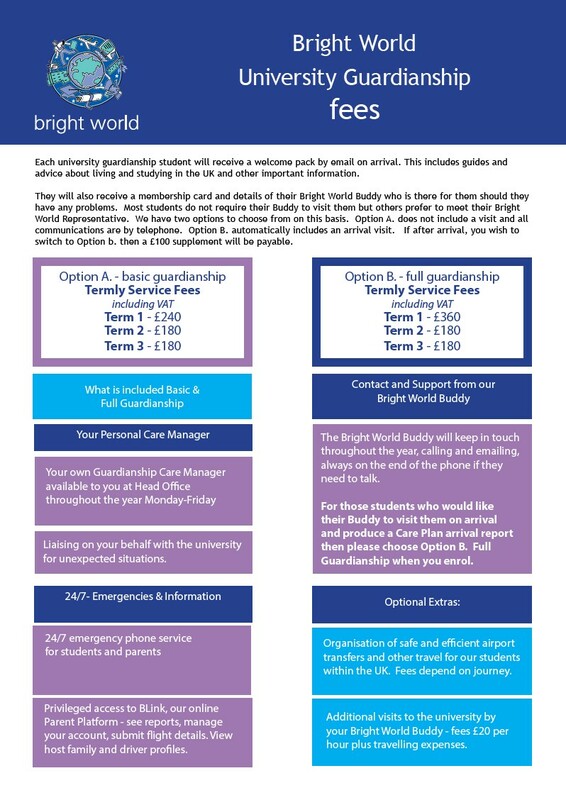 - full guardianship Termly Service Fees including VAT Term 1 - £360 Term 2 - £180 Term 3 - £180 Contact and Support from our Bright World Buddy The Bright World Buddy will keep in touch throughout the year, calling and emailing, always on the end of the phone if they need to talk. For those students who would like their Buddy to visit them on arrival and produce a Care Plan arrival report then please choose Option B. Full Guardianship when you enrol. Your own Guardianship Care Manager available to you at Head Office throughout the year Monday-Friday Organisation of safe and efficient airport transfers and other travel for our students within the UK. Fees depend on journey. Your Personal Care Manager 24/7- Emergencies & Information Optional Extras: Privileged access to BLink, our online Parent Platform - see reports, manage your account, submit flight details. View host family and driver profiles. Additional visits to the university by your Bright World Buddy - fees £20 per hour plus travelling expenses.